Doctor Who: BAD BLOOD | Warped Factor - Words in the Key of Geek. 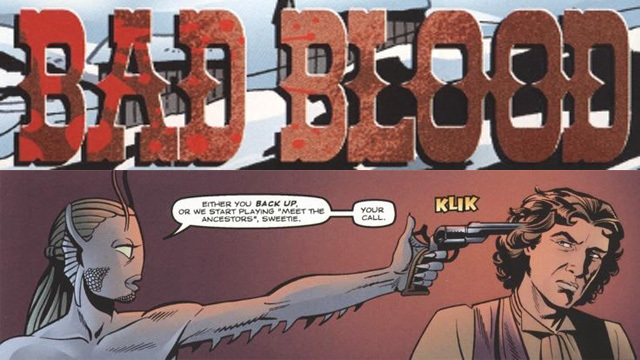 Bad Blood is an interesting story. I had it labelled as Wild West and due to my dislike for the Western genre, had some predisposed ideas about it. I was looking forward to the fact it involves one-time companion Destrii and her uncle, Jodafra, but the setting was putting me off. On reading the story, I’ve realised that this is not a Western. This is a proper pseudo-historical story set in the American West of the 19th Century. It is much closer in tone to the 11th Doctor audiobook The Runaway Train than it is to A Town Called Mercy. 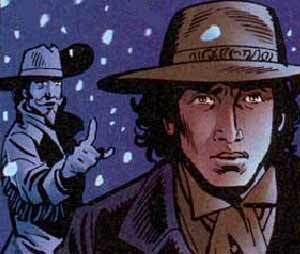 Originally appearing in five-parts (DWM 338-342) Bad Blood sees the Doctor arrive in Dakota in 1875. Here he meets the Lakota Sioux and, in particular, their chief – Sitting Bull. He discovers that his arrival was foretold. The Doctor and the Sioux go to a nearby town to investigate mysterious happenings and find all the locals have vanished. General Custer and his men arrive and are about to punish the Sioux for the missing townspeople when the group are attacked by werewolf creatures. Regrouping in the hills, an uneasy truce is formed. During a second attack by what have been identified as windigo, an alien spaceship arrives and massacres the monsters. The spaceship belongs to Jodafra and Destrii, old acquaintances of the Doctor. It transpires that the windigo are all part of a scheme of Jodafra’s to gain control of time. When Destrii realises Jodafra is going to sacrifice Sioux children as part of this scheme, she destroys his machine and the remaining windigo. This is a great story. The 8th Doctor is well-characterised and the guest cast are all interesting. The windigo are maybe a little cliché in appearance (they are basically big werewolves with glowing red eyes) but they are not hugely important to the plot. They are the blunt instrument that Jodafra, the real villain of the piece, is using to gain mastery of the timelines. In a story like this, the Doctor was always going to side with the Sioux, but it is interesting to see the uneasy alliance form between the two groups, especially when Jodafra arrives and tempts Custer into aiding him. The scene where they kidnap the children is chilling, all the more when both Custer and Destrii realise Jodafra has lied to them. The revelation that alcohol is the catalyst for the change from human to windigo is a little like the sugar in The Moonbase giving people the cybervirus although the fact this saves the teetotal Custer and the Sioux who never partake of the ‘white man’s poison’ is a good way for the Doctor to discover the truth. Jodafra and Destrii are an interesting pair. It’s been a long time since I read their introductory stories. Destrii, of course, features heavily when she swaps bodies with the Doctor’s then companion, Izzy. Jodafra first appeared when this plot arc was resolved but I must confess to not remembering a huge amount about him, other than he was a bit of a rogue. In this story, he reminded me of Doctor Knox from the audio range. A non-Gallifreyan time traveller, out to cause mayhem. Admittedly, his ultimate goal seems more catastrophic than Doctor Knox’s (which usually revolved around money-making schemes) but his manner is all loveable, sophisticated rogue (until his true plan is revealed and also the way he savagely turns on Destrii for ruining his plans). Destrii’s reintroduction is also interesting. At the close of this story she becomes the Doctor’s companion for the 8th Doctor’s last two comic strips in DWM. This story sees her as an antagonist who has a change of heart. In the grand tradition of characters such as Turlough, Big Finish’s Thomas Brewster and, to a lesser extent, Captain Jack in his debut story, she is initially self-serving and ready to kill innocent people for her own ends. When children become involved she baulks and turns on Jodafra, getting beaten and seriously injured for her troubles. There are also echoes of River Song in Destrii (not least her use of the phrase ‘Sweetie’). I forget how Destrii develops in the following stories (I recall she adopts a holographic image projector thingy to make her look human) but she does seem almost like a prototype for Majenta Price, the 10th Doctor alien companion who was also self-serving and no averse to violence. Maybe there was a planned story arc for Destrii that got curtailed due to the return of the new series and this was something picked up and retuned/redeveloped for the character of Majenta. The story also includes a little hint towards the Doctor’s attitudes to spirituality. The Sioux are in tune with the spirits and Sitting Bull invites the Doctor to join him on the astral plane. The Doctor is initially reluctant saying he isn’t good with spiritual things, but when he accedes, he finds himself on some form of telepathic plane which seems to open his mind to the idea of spiritual beings be real. This seems slightly at odds with how the Doctor has approached this kind of thing in other stories, particularly the Big Finish audios. Winter for the Adept, for example, sees the Doctor very much believing in ghosts. It’s a nice touch though, and allows the Doctor to have a small moment of enlightenment. It has echoes of how the old hermit on the hill on Gallifrey enlightened him as a young man (as recounted in The Time Monster). I enjoyed Bad Blood more than I thought I would. And the Doctor gets to wear a stetson-style hat. Hurrah!